Each summer, an average of 400,000 children, teens, and adults participate in summer library programming. Funded by the Institute of Museum and Library Services and supported by the Boston Bruins, the MBLC works with the Massachusetts Library System (MLS) to coordinate the statewide summer library program. Massachusetts has been part of the national Collaborative Summer Library Program (CSLP) since 2011. Support from the Massachusetts Library System allows for participation in the CSLP. Visit the MLS Summer Library Program Guide for more information and summer related resources. 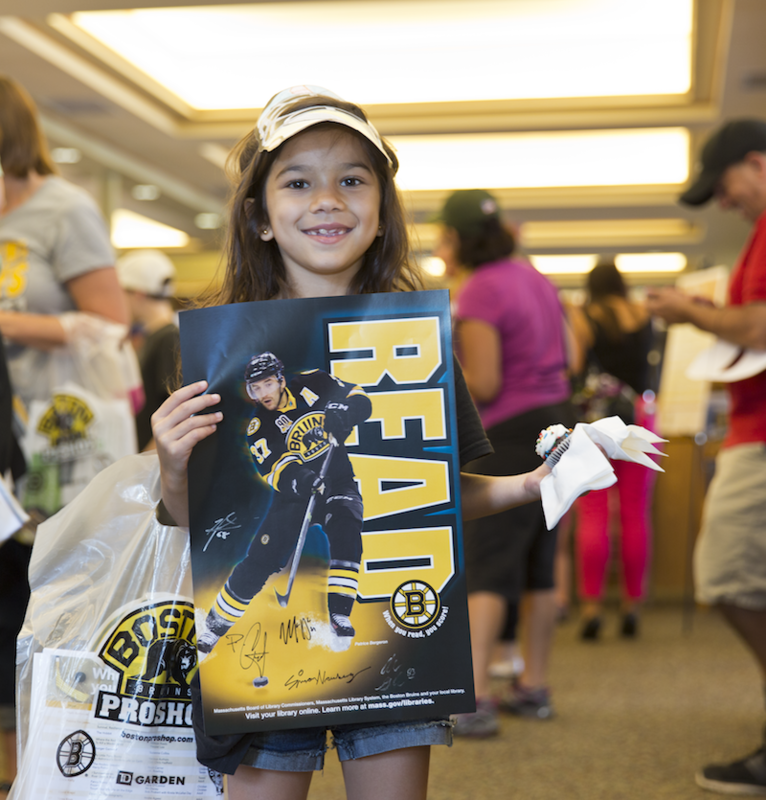 The Boston Bruins work with the MBLC and MLS to increase literacy by encouraging children, teens and adults to participate in statewide summer library programs.To see what libraries the Bruins have supported through visits and prizes, click here. 2019 marks the third summer that the MBLC has partnered with the JFK Presidential Library and Museum. Find online resources relating to the fiftieth anniversary of the moon landing here. Support for Summer grants allow libraries to get funding for summer reading software and new summer projects. Summer library programs in Massachusetts are free, fun, and open to all kids, teens, and adults. Residents can participate in summer reading no matter where they are through mass.gov/libraries. Summer reading helps kids avoid the "summer slide" and stay ready for the upcoming school year. Read our summer success stories to see the impact that summer reading has. The Boston Bruins work with the MBLC and the Massachusetts Library System to increase literacy by encouraging children, teens and adults to participate in statewide summer library programs. To see what libraries the Bruins have supported through visits and prizes, click here.